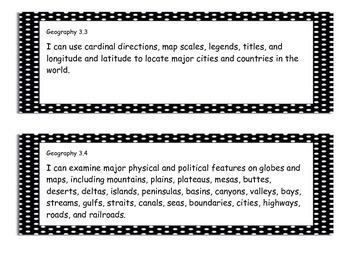 These "I can" statements follow the new Tennessee state Social Studies standards for 3rd grade World Geography and Cultures curriculum. 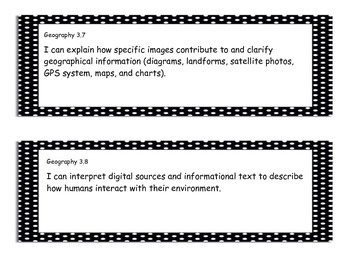 They can be copied on cardstock, laminated, and displayed for the standards currently being taught or used as a review for testing. 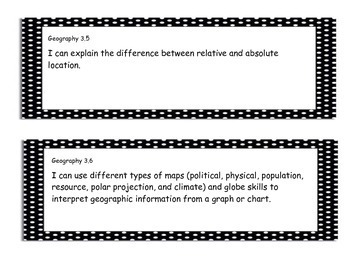 The border used was downloaded from the TPT store Endless Possibilities. 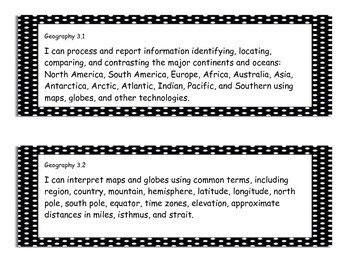 The link for this product is: https://www.teacherspayteachers.com/Product/Polka-Dot-BW-Page-Border-257485. Thank you for this product!